Sometimes you might need to convert your text files into the HTML format to view them in a web browser or publish them on the web. 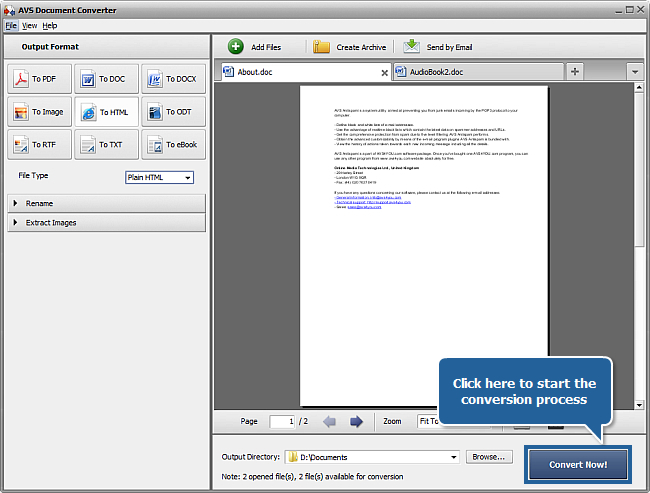 AVS Document Converter gives you an opportunity to save your documents as HTML or MHT files which include graphics and other embedded content into single web archive. Click the To HTML button in the Output Format section of the Working Area. 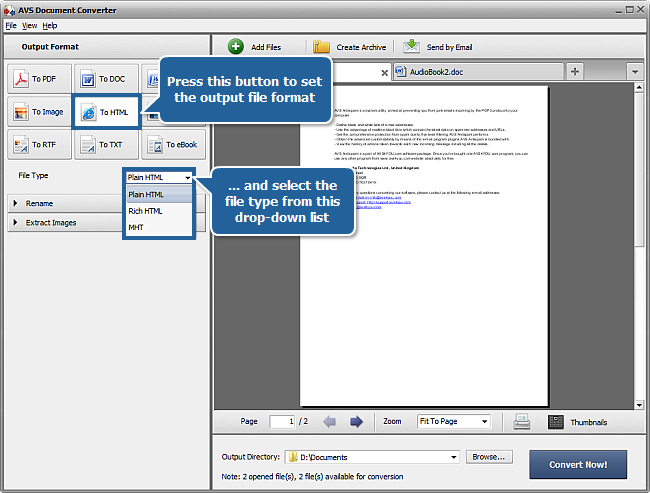 Select the desired file type from the File Type drop-down list below the format buttons. The available options are Plain HTML, Rich HTML and MHT. If you select Plain HTML format you will receive a page with the .html file extension and a separate subfolder with images (in case your input files contain them). This folder will be named as yourfilename_files. You will be able to view the result with the help of any browser you use. If you select Rich HTML format you will receive the automatically paginated document with the .html file extension and a separate yourfilename_files subfolder with images (in case your input files contain them) and additional files. 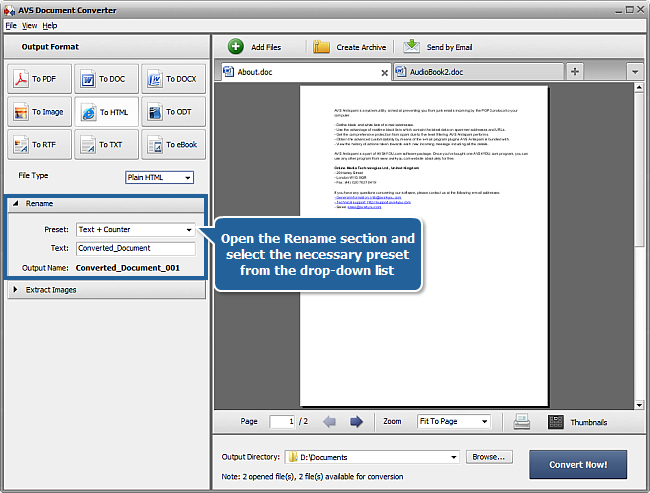 You can include a toolbar which contains zoom and navigation controls into the converted file using the Add Toolbar option in the Format Settings section. If you select MHT format you will receive a single web page archive with the .mht file extension. 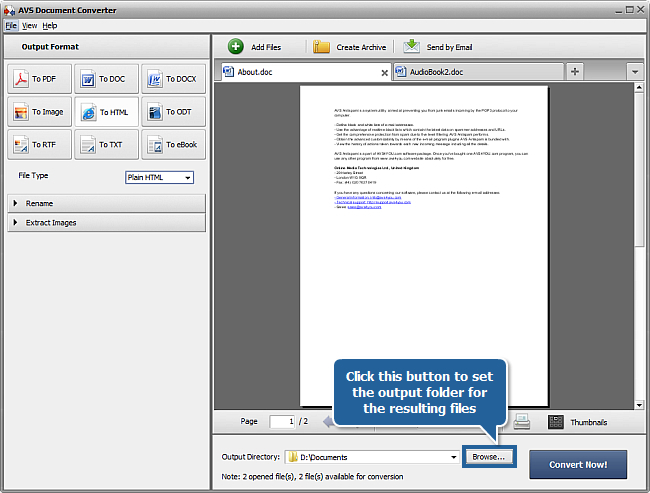 You will be able to view the result with the help of Internet Explorer or another browser that supports MHT files. 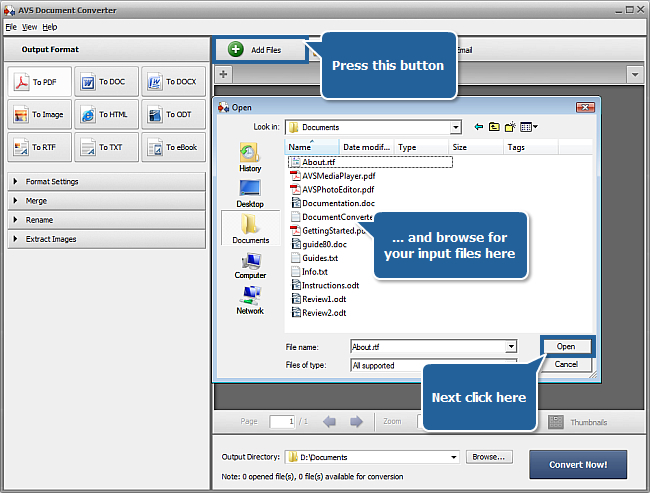 Now you can press the Open folder button and view your new files of HTML format using your web browser.